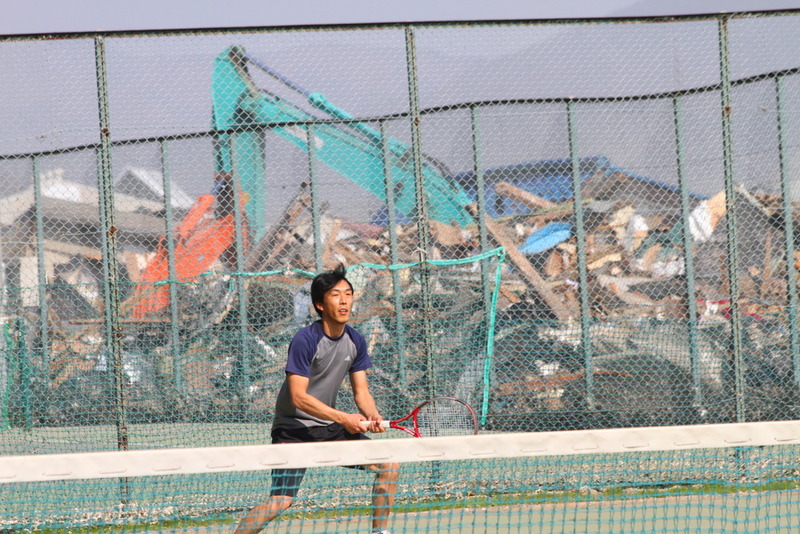 ISHINOMAKI, Japan | In a sea of wreckage and chaos, the tennis courts are an oasis of order, providing a sense of calm to the club members who worked hard to clear away mud and debris after the March tsunami. 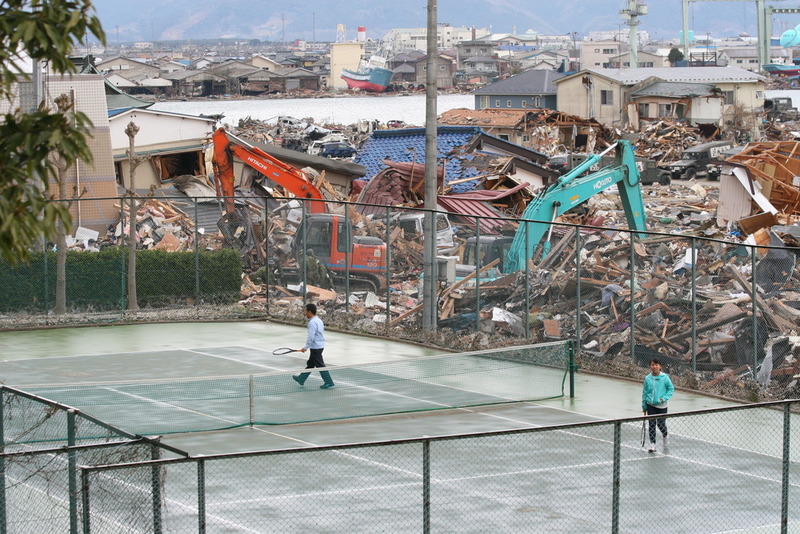 As cranes sort pulverized homes into hills of debris and soldiers and police in protective white suits search for corpses, tennis players whop balls back and forth, oblivious to the apocalyptic scene around them. 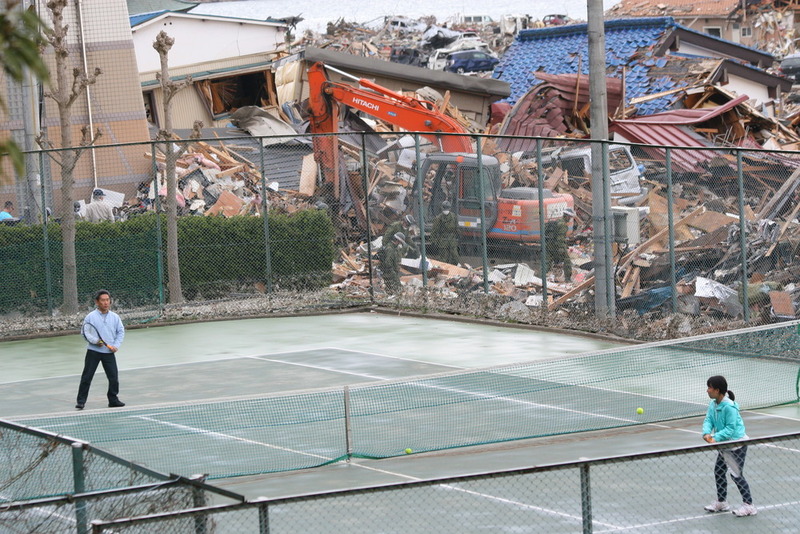 Unlike thousands of structures in Ishinomaki, which once had 160,000 residents, the tennis club emerged relatively intact because it sits on slightly elevated ground beside a steep hill. 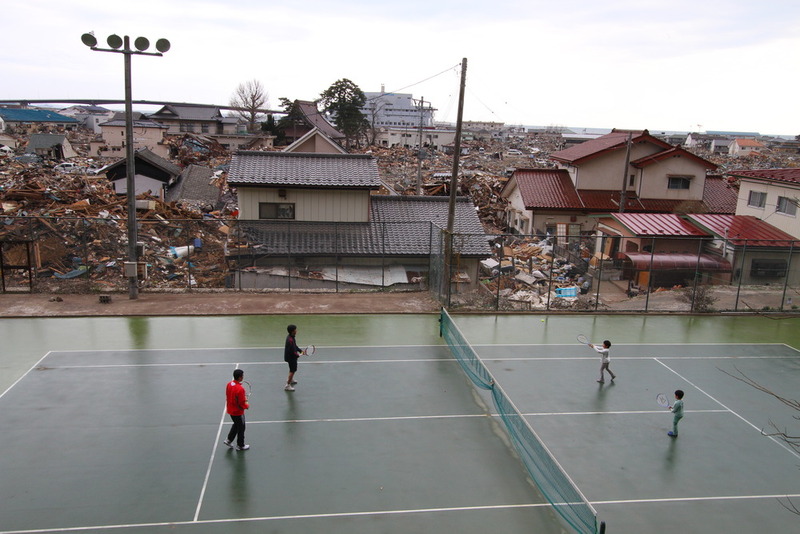 While Mrs. Honma and the tennis players were among the first hardy survivors to restore premises in the disaster zone, increasing numbers of survivors have been leaving shelters for the privacy and relative quiet of their own damaged homes. Local officials have said that about 9,500 Ishinomaki residents have returned, often to the upper floors of homes that were above the level of flood waters. Spring nights are now warm enough to sleep without heaters, and some homes have electricity. Volunteers have been delivering packages of pre-cooked meals to many in their homes. Supermarkets in dry areas farther inland have been open for the past month, drawing traffic jams of survivors stocking up on supplies. Local officials say the homes and areas are unsafe, but they cannot legally stop the survivors from returning. High tides have continued to flood large tracts of Ishinomaki, where land sank by three feet in some places after the March 11 earthquake and tsunami. But many people, who have endured almost 60 nights without privacy or proper sleep in shelters, say they can’t wait. Out of an estimated 10,000 temporary homes needed in Ishinomaki, the government says only 1,800 will be ready by next month. Central government officials also want people to remain out of low-lying seaside areas, because they are currently brainstorming plans to reconstruct cities on high ground safe from tsunamis, which tend to hitJapan at least every 20 years on average. The Environment Ministry is also warning people about cancer risks from asbestos. The fiber, used for insulation and fireproofing in many older buildings in Japan, was banned only in Japan in 2006, about three decades after health hazards emerged in the United States. Activists have found particles of asbestos in the dusty, windswept air in northeast Japan. While earlier tests found levels within Japan’s safety range, they could rise as cranes and clean-up crews shake loose the fibers from wreckage. The health ministry has passed out about 90,000 masks in the disaster zone. The environment ministry has issued recommendations on how to dispose of materials containing asbestos, but those warnings are difficult to enforce because of the enormity of the disaster, stretching across more than 50 towns and cities in a 400-mile- long swath of the Pacific coast. The ministry, which has been monitoring asbestos levels in 15 locations across three prefectures, is expected to release results later this month. After the 1995 Kobe earthquake, crews cleaned up 170,000 damaged buildings without government measures to enforce the use of masks or to limit the spread of dust. Studies show that tiny asbestos fibers can enter the lungs, causing inflammation and raising the risk of lung disorders, lung cancer, and the rare cancer mesothelioma, which can emerge decades later.